The Welbourne Jazz Camp takes place every summer on a country estate in Virginia, but it began with a chance meeting in New Orleans. The Loose Marbles, a well-known local band led by Ben Polcer and Michael Magro, had just finished busking on Royal Street when they were approached by Nat Morison, who was so impressed that he asked them to play at his annual summer party. A few months later in 2007, the band arrived at Welbourne, a 180-year-old horse farm in the foothills of the Blue Ridge Mountains in Virginia. The Loose Marbles were such a hit that they were invited back for the next three years, each time bringing along their dancers: Amy Johnson and Chance Bushman. In 2011, Amy Johnson, a dance teacher, choreographer and mastermind behind The Ultimate Lindy Hop Showdown, came up with the idea for a jazz camp for adults. Polcer admits that he thought she was ‘crazy,’ but went along with it, and they traveled to Virginia in the freezing winter to pitch it to Morison. He too said they were crazy—but gave his approval, and the camp had its first year that summer. Six years later, Welbourne Jazz Camp is going strong and has become one of the most unusual events of its kind in America. 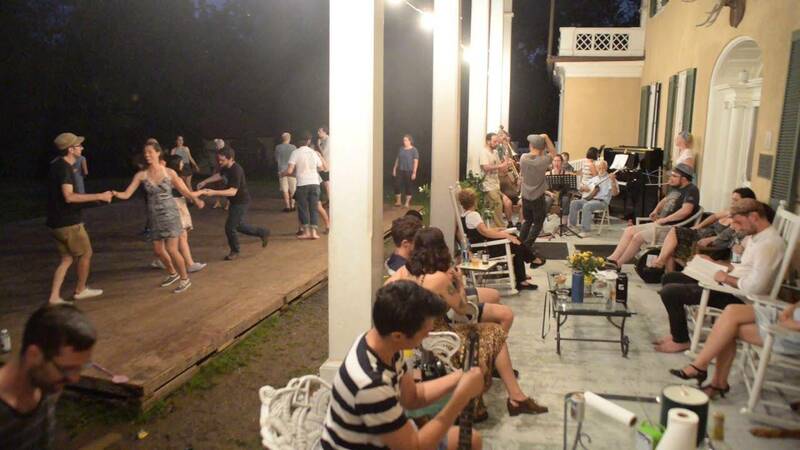 Unlike other dance or music camps, which often take place in hotels or college campuses, Welbourne, which is in Middleburg, Virginia, is set on 530 acres of farmland with dozens of retired horses roaming the fields. Most importantly, the camp is supported by a family whose passion for traditional jazz runs deep. Welbourne Farm has been in Morison’s family since it was bought in 1830 by his great-great-great grandfather, Col. Richard H. Dulany, who founded the oldest horse show in America and one of its oldest fox hunts. First night 2016, Youtube capture. Aside from the setting, the most extraordinary thing about Welbourne is the staff-to-student ratio. Each of the two weeks in August has a maximum of 25 students and roughly 10 teachers, a ratio of almost two-to-one. The daily schedule is loosely defined as mornings for dance lessons, a mixture of jazz, lindy hop and tap; and afternoons for music which can be collaborative work or solo practice on any instrument the campers bring with them. In the evening, there is a jam and dance on the porch where the two worlds meet, and the magic happens as campers dance one song, then sit in with the jam for the next. The dance teachers are among the best known in the world for swing dancing and jazz movement and have included Evita Arce, Nathan Bugh, Andy Reid, Laura Manning, and Mikey Pedroza. The music teachers are usually associates of Polcer who are all experienced and respected players. They include Jason Jurzak, who plays sousaphone for Meschiya Lake’s Little Big Horns, and Dennis Lichtman, who leads Mona’s Hot Four and Brain Cloud in New York. Others have included Russell Welch, a guitarist with the Little Big Horns, singer and clarinetist Aurora Nealand, trombonist Charlie Halloran, bassist Cassidy Holden, and jazz singer Judy Kurtz. A week at Welbourne costs $1,600 for a bed in the main house, and $1,050 if camping or commuting from off-site, though there are discounts for early booking and payment plans available. Polcer said that it does sound like a lot, but when factoring in the location, all the meals being included, and such a level of individual instruction, he considers it reasonable.